After departing home at around 10:00 to reach Masjid Jamek at around 11:00, only to move around from there to Central Market and later to Dataran Merdeka to witness myself the heavy police presence in the city, getting drenched in the rain while waiting for the rallying crowd, following the crowd all the way to Istana Negara, in the rain until the crowd broke up at around 17:00, and then visiting the Hang Tuah police station, simply just curious how the detained participants of the rally were doing, and reaching home at round 19:00, I am tired. I cannot feel my legs and my brain is simply refusing to churn out words. Thus, photos. The police blocked off all entry points into Dataran Merdeka. Though I was not there when it happened, this was close to the spot where tear gas was launched. The rain might be a blessing because it rendered the tear gas useless. Rumors had it that up to 80 people were detained. TV3 says 15. Al Jazeera, 23. According to Sonia Randhawa, at least 20. The above photo was taken around 13:00, just before the cloud decided to release everything on this fair earth. There were 2 copters hovering around Dataran Merdaka. Both kept circling the Padang, probably updating the police force of the situation on the ground with an bird’s eye view. For your information, Dataran Merdaka was full of members of the Federal Reserve Unit, reporters but not participants of the rally. Oh, yeah, and me! The day started ominously cloudy. It rained from early morning. The rain took a pause only to pour much heavier later. I was caught in the rain and took shelter at the Kuala Lumpur Library which sits right next to the Royal Selangor Club. At around 14:00, it started to relent and noise could be hear from across the field. In retrospect, I have no doubt that that noise was associated with the confrontation between the crowd and the police which involved tear gas. I rushed across the Padang to find out what was going on. It turned out, the crowd had decided to skip Dataran Merdaka, which was to be the main rallying point, and head to the final destination, Istana Negara instead. That decision had probably kept the rally from becoming violent. Given the Prime Minister “saya pantang dicabar” warning, honestly, I feared for the worst but things went smoothly and that convinced me to join the crowd instead of following them behind the police line, which was what I did earlier. I do not know how did I get the privilege but I think, if one has a DSLR, some liberty stands mightily in the face of tyranny. The police seemed to give me some kind of respect, probably mistaken me as a reporter. Or maybe, they had a larger cake to deal with. But boy, at the Istana, some said it was 20,000, some 40,000, others insisted there were 80,000 people. Whatever it was, the size of the crowd was sufficiently large, as far as the eye could see, for one to say it was uncountable! Li Tsin overhead an old lady remarked: MILLIONS! Here, the Police is seen rushing to reinforce the human wall. Quite unnecessary since the crowd was remarkably organized and disciplined. A line formed by the organizer of the rally separated the crowd from the police line, thus preventing any untoward and unwanted incident from happening. I was amazingly impressed and confident that this would be a peaceful rally, which it was. I felt safe mingling with both the crowd and the police. 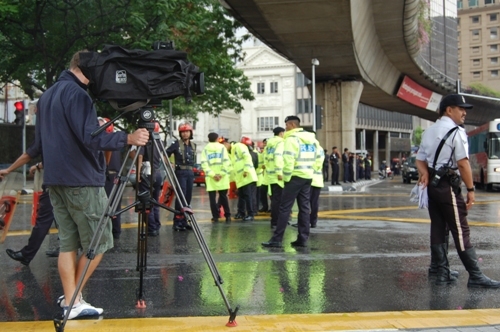 A rally participant recording a speech made by somebody. Police. Yes, I crossed the police line with impunity countless of times. And I love my D40 even more for that. Okay, okay. I am getting over myself. A leader of Parti Keadilan Rakyat, Khalid Ibrahim with a songkok wrapped with a yellow cloth, and in the background with the turban, Abdul Hadi Awang of PAS, were preparing to hand over the Bersih memorandum to a representative of the King. Look at the boots! Awesome. I want one. Yeah, it was starting to become boring. This is clear through my mediocre effort at creative photography, whatever that is supposed to mean. They passed the memorandum to the Istana. In the photo, Anwar Ibrahim, Khalid Ibrahim (Are these guys brothers? I know, I know. That is lame.) and Lim Kit Siang. If you notice, the photos have some kind of glow. I did not do any digital editing to cause that; it was the rain. The rainwater affected the lens; on whether for better or for worse, I am quite unsure. More photos later. For now, I am grateful for having a bed to lie on. Before I end, I would really love to hear what the highly intelligent-insulting Information Minister has to say. Previously, he shouted out loud that it is ridiculous to expect a large groups of people to congregate to support the rally. He should be eating his words right now. But I bet he is used to that, anyway. Wow. The scene is quite different than the one I had gone through today. pp/s — for photos on the clash at Masjid Jamek, Kickdefella was there. on 01 Aug 2009 at 17:16 the __earthinc » Blog Archive »  Of how many are protesting against ISA, on the ground? on 13 Jul 2011 at 21:37 the __earthinc » Blog Archive »  Second thought, Mr. FRU?